After kicking off festival season with L’Oreal Paris Colorista a few weeks ago in quite a pink manner (find proof here) this weekend Lennart and I got ready for the next one. Up on the menu: By the Creek festival, a smaller festival near Utrecht and alongside – who would have guessed – the creek. Pretty cool setting if you ask me. What I like to do before getting festival ready is to pump up the volume of my favourite music a little bit (sorry, neighbours! ), showcase the outfit I’m going to wear (I actually even tend to take pics of my little mini exhibition, I kid you not) and last but not least: fix the hair. I like my hair to be a bit messy (and I finally found out how to make my super straight hair a bit more untidy). Because L’Oreal Paris provided me with quite a broad range of incredibly awesome hair products last time I was curious to try the spray for this occasion. Such a fun way to play with different hair colours if you don’t want to dye you hair permanently. It’s basically like make-up for your hair! In case you missed the previous post or just to refresh your mind: last time I tried a wash out. A very easy to apply substance that lasted for 2-3 washes. This time I opted for the slightly more subtle effect of a grey spray, which came in quite handy, because I’m in doubt whether to go back to the grey hair I’ve been sporting for years or stick to a slightly more natural blonde tone and the colour of this spray I used is gone after 1 one wash (or maybe two if you use a less subtle colour, because this spray – just like the wash out – comes in many cool colours, ranging from grey and lilac to blue, green and very flashy fuchsia. Epic!). 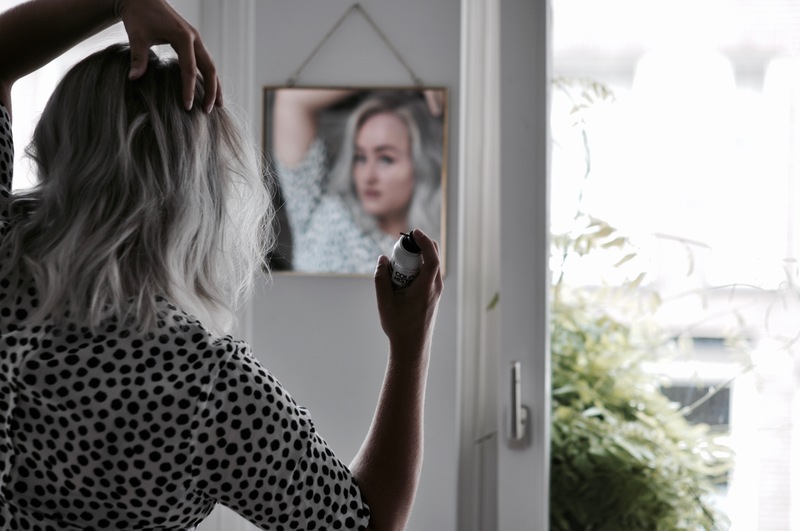 Applying the spray is as easy as it looks: I just styled my hair the way I wanted to (in this case: create some random messy waves with a straightening iron), grabbed the L’Oreal Paris Colorista spray in grey and sprayed like there was no tomorrow. At the end I took some random locks and sprayed some extra product on them to create more depth basically. Pro tip: always lock in the product by using a hair spray, otherwise the product might still stain a little bit. It’s super easy to wash out anyway (the colours was all gone after washing my hair just once, the perfect one-time-occasion-solution! ), but especially when you want to try the darker colours you might not like stains on your festival outfit. So hairspray it is! As for the outfit: I decided to wear this good old dress that has been in my closet for years already. Honestly, if H&M ever decided to bring this dress back to the collection, I’d be more than happy to buy it in every colour or pattern I could possibly think of. When it comes to footwear I always pick either ankle boots or sneakers for festival attire, I can’t imagine wearing anything else, and I like to style things off a little bit by adding a hat or cap, cool sunglasses and my usual jewellery. Just curious: how do you get festival ready? Would you try one of the Colorista colour sprays for a day? Or would you rather try a wash out? What’s your favourite festival look? If you even used a Colorista product as well, feel free to tag me in your social post, I’m curious to see the result! This post was written in collaboration with L’Oreal Paris Colorista but, needless to say, all opinions and experiences are my own.